In my previous article about Maison Ogier and their wines from Chateauneuf-du-Pape, I told you about the four different soil types and their effects on the grapes’ flavours in the wines. 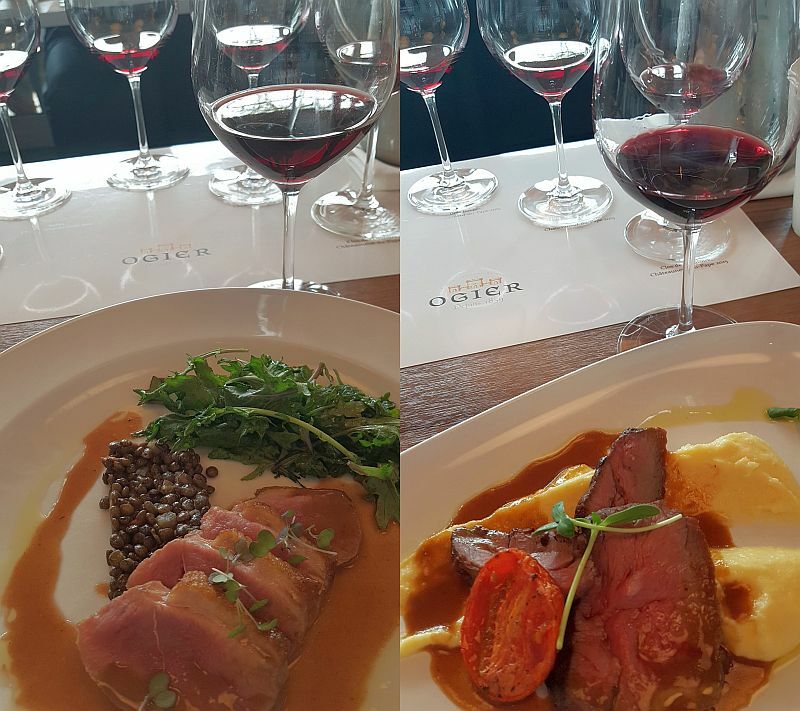 In this article, I take you through tasting some of Maison Ogier’s wines with food paired at Provence Marinaside in Yaletown. Maison Ogier Héritages, Côtes du Rhône Red 2016 – Made with Grenache, Syrah, and Mourvèdre. I was told there is also 5% Marselan in this wine. Marselan is a grape formed by crossing Cabernet Sauvignon and Grenache. Opaque ruby colour. Deep, ripe cassis nose. Fuller body with bright acidity. Ripe cassis. Medium tannins but you can feel the acidity more. There is a hint of floral in the background. Maison Ogier Héritages, Crozes-Hermitage Red 2014 – Made from 100% Syrah grapes. This wine spends 12 months in oak. The vines grow in the rolled pebble soil. There is some chalkiness on the nose. Full body with good acidity. Flavours of ripe dark fruit, bitter chocolate and some pepperiness. Maison Ogier Lou Caminé, Lirac 2016 – Same blend as the l’Oratoire (see my Part 1 article). This wine has more acidity and fruitiness. It is opaque ruby in colour. Very aromatic cassis and red cherry aromas. Full-bodied, round with firmer tannins. Fruity cassis, red fruit and a hint of cocoa. Good acidity makes this wine fresh. Tart finish with medium tannins. The seared scallop dish was delightful. The scallops seared nicely; not overdone. Very juicy. The hedgehog mushrooms providing some meaty texture. You could almost mistake them for escargot (it actually sounds like a great idea to add to this dish). I am not sure if the lavender was meant for decoration only or for sampling with the dish, but I did the latter, and it was fantastic to taste the lavender. Its floral flavour bloomed in your mouth and then you had the butteriness of the scallop. And then you had the Maison Ogier Héritages, Côtes du Rhône White 2015 with its acidity and tropical fruit and butterscotch flavours further enhancing this dish. Well done. Next was the seared duck breast with lentils. The duck still on the rare side, with a bit of crispiness on the top of the fat of the breast. Tender and juicy, paired with the earthiness and texture of the lentils and sweet and sour of the beurre rouge. The Maison Ogier Héritages, Crozes-Hermitage Red 2014 ripe dark flavours was a complementary pairing. Rich food and ripe dark fruit flavours from the wine. I enjoyed the fattiness in the grilled lamb sirloin and the creaminess of the polenta with it. The acidity and red fruit flavours of the Maison Ogier Lou Caminé, Lirac 2016 again worked well. The acidity cutting through the fattiness and the red fruit flavours, keeping the dish bright. Lastly, we had the dry aged cheeses, dried cherries, and dried cranberries, with Raincoast crisps. This may have been my favourite pairing because of the amazing explosion of flavour when you tasted the Maison Ogier Héritages, Côtes du Rhône Red 2016 at the same time as trying a dried cherry. The dried cherry on its own was chewy, a little sweet, but the cherry flavour subdued. Adding the wine, made the cherry flavour explode and fill your mouth as well as bringing out the sweetness of the cherry. The cheeses were, of course, an excellent choice for pairing with this wine, as the tannins softened a bit more letting the fruit flavour of the wine come out more. I hope I made you hungry and thirsty. Give Provence Marinaside a chance for lunch or dinner, if you have not already visited, and try their wide selection of wines. Thank you to Select Wines for inviting me to try the wines of Maison Ogier and learn about the winery and the terroir of Chateauneuf-du-Pape.